Over the coming week, you'll find position-by-position projections for the 2019 Jackson Generals, with new players examined each day. There are no guarantees made: Jackson's 25-man roster for Opening Day will be impacted by injuries, Spring Training performance, transactions, and many other unpredictable elements. None of the players included in this preview have previously spent significant time at a level beyond Double-A. You can stay up to date with relevant Generals and D-backs news by following us (@JacksonGenerals) and the D-backs (@Dbacks) on Twitter. GINKEL: Finished season as Jackson's closer. Multiple streaks of 14+ innings without giving up a run. One of 7 MILB relievers with 100 Ks despite no games started. Holds up under pressure, even without his best stuff. Solid effort against high-level prospects in the Arizona Fall League: 2.53 ERA, 10.2 IP, 17 K, 1.16 WHIP. Could be the league's best closer in 2019; Reno isn't that far away. ATKINSON: Veered off course as a starter (3-11, 5.25 ERA), but threw smoke in a late-season relief stint (2-0, 1.38 ERA). Saved the season with 3 1/3 scoreless innings of relief in Game 2 of the League Championship Series. Mixes fastball with above-average changeup and curve. Undrafted signee in 2016 has risen quickly partly because of strong work habits. MARK: After an All-Star nod in the Cal League (1.45 ERA), underwhelmed in his first month at Double-A (5.40 ERA). Struggled to be effective up in the zone. Throws a thoroughbred split-change, the horse just needs some more run. 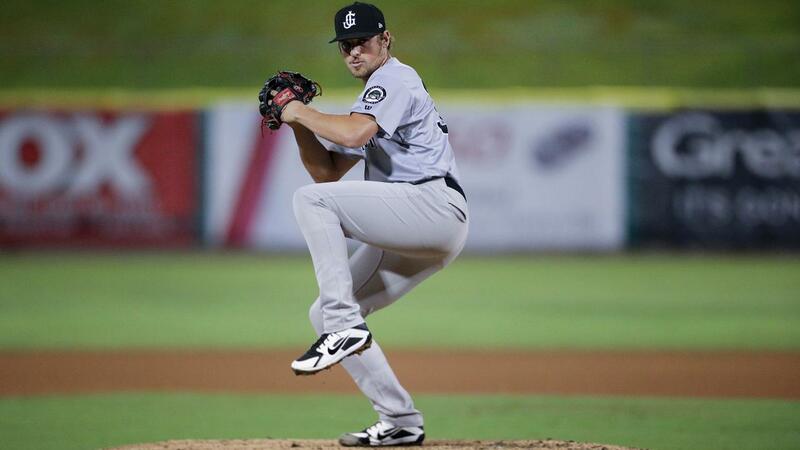 Had some growing pains in the Arizona Fall League (9.95 ERA). Looking to bounce back to start the year. AGUILAR: Old for Double-A (27), but may not stay long if he shows he can handle it. Played a critical role last year as a late-season bullpen arm. Against LHH, K'ed more (21) than he allowed walks or hits to (16). Like Donatella, works quickly, delivers often. MCCULLOUGH: Heater/slider DJ. Hit a wall mid-season after going on the DL, unable to find the plate. When in the groove, fastball finds all edges of the zone, and the slider stays down. Like Yoan Lopez before him, has great clubs in the bag, but must prove he can to hit all the shots. JETER: Any-mound, any-inning, any-hitter mentality. Fastball won't break the gun, but can work multiple innings in a pinch and weaves his breaking ball throughout. At his best, can induce pop-ups to all fields; at worst, experienced long relief for a team that will have a young lineup and may struggle to score. LEWIS: Right-hander caught between bullpen and starting roles. Largely long relief in 2017, though he started the year in the rotation and threw alright in April (20.0 IP, 4.05 ERA), including five hitless frames against Birmingham. DL'ed for most of June through August and wasn't consistently sharp at year's end. Secondary pitches have to improve to maintain effectiveness. GARCIA: Began and finished 2018 on the DL. 19 of 24 appearances were scoreless, including a streak of 19.0 clean innings over 13 times on the hill. Recorded more than three outs in half of his games. Less-than-wow stuff, but does the job. Fringe chance to make the Jackson bullpen, but more likely headed back to Visalia when healthy.